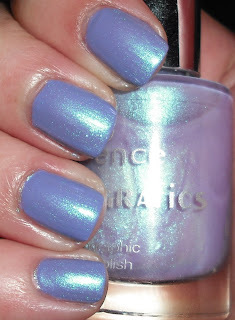 I saw the Essence @holographics.com collection a few months ago at Ulta. This is a case where I get impulsive because Essence collections can be hard to find in the US, so I picked these up. These are not holographic polishes in the slightest. These are duochromes. They had 3 colors, but I'm just sharing one with you today. Sadly, 2 of 3 colors are quite sheer, and look pretty icky on their own. I don't regret getting these because over certain colors they looked great. Gagalectric is a sheer lavender shimmer infused with a bright blue duochrome flash. This is really stunning layered! The blue flash is intense. I love how it completely changed the look of the Orly. I did not bother to show you it on its own. The duochrome and pigmentation of this color are lackluster by itself. I would never wear this alone. I think us nail addicts are on the same brain wave, so I don't think many of you would find it attractive on its own either. OH MAN! I haven't seen these at all...and I don't blame you for picking them up. This one is gorgeous!!! I wish Ulta had these online! I picked up the blue one and had to go back for the other two. They are amazing! I need some more duochromes in my lice. Gorgeous! Man, I wish there was an Ulta here. This is gorgeous! I saw a swatch that was opaque, maybe 3 or 4 coats, and I loved it. Too bad too many layers drives me nutso. I tried to look for this one, but no luck. It was pretty picked out at my Ulta. I did get Blue Ray though! WOW! I cannot think of anything better to say...other than I am jealous! I want this one too but doubt I will get my hands on one ever. I'm in love with this one! !